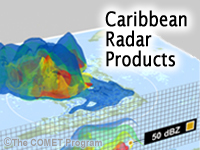 This module provides examples of radar imagery from various locations in the Caribbean to demonstrate the different types of images available. Also, examples of different meteorological and non meteorological features are presented to show features seen in island locations. Distinguish between real cloud signatures and spurious echoes like sea spray, second trip echoes, and electromagnetic sources.